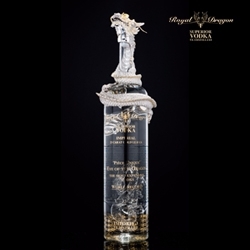 Hong Kong, Hong Kong S.A.R., October 03, 2017 –(PR.com)– Royal Dragon Vodka and Studio City present the World's most Valuable Bottle of Vodka, "The Eye of the Dragon." Royal Dragon Vodka, fully owned by Dragon Spirits Limited, in collaboration with entertainment resort Studio City, will unveil "The Eye of the Dragon" for the first time ever at Studio City's 2nd Anniversary Gala Dinner, themed "Ice x Fire" on October 7th, 2017 in Macau. Valued at a staggering US$ 5,5 mln, this beyond luxury masterpiece is a 6 liter bottle of the most premium Royal Dragon "Imperial" Vodka, incorporating an extremely rare, round and fancy intense yellow diamond of 50 carat (GIA certified) plus almost 15,000 additional diamonds and nearly 2 kg/4.5 lbs of solid 18 karat gold. As a demonstration of excellence, craftsmanship and perfection, "The Eye of the Dragon" is a truly breathtaking and spectacular masterpiece. This "Piece of Art" was created in partnership with Scarselli Diamonds New York, one of the leaders and an authority worldwide on fancy colored and unique rare diamonds. Based out of Hong Kong and under Dutch ownership, the Royal Dragon Vodka premium lifestyle brand was successfully launched in 2012. The brand's expansion accelerated with its market introduction into the duty-free channels from 2016 onwards.